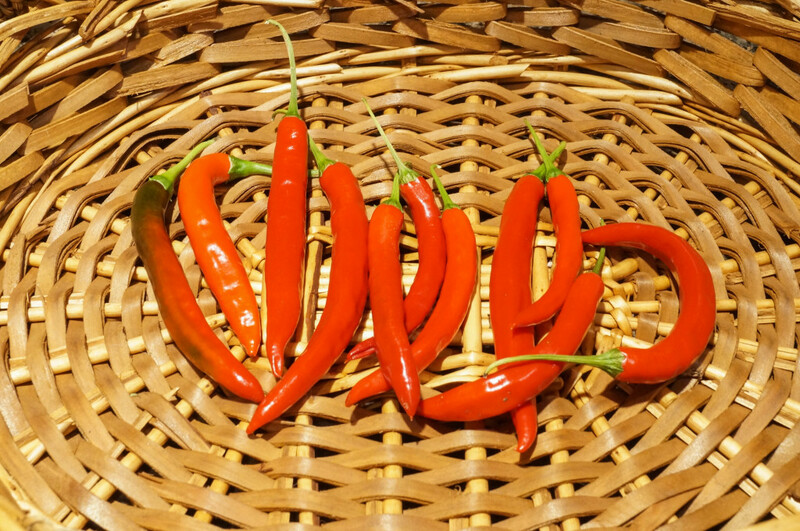 I don’t enjoy a ton of heat in my food, so I was in for quite the surprise last summer when I accidentally picked up a couple of cayenne pepper plants for my garden instead of bell pepper. I will use the occasional cayenne pepper, but there was no way I could go through the entire batch those two plants yielded. In a way to not waste the excess, I dried the peppers then ground them into a powder. Another way to save the extra is to freeze the peppers (this will retain their color and flavor, but the texture will lack a bit- no harm if they will be chopped up and cooked). Note: Always wear rubber or plastic gloves when handling cayenne peppers to prevent the oils from irritating your skin. Take care to not touch your face or eyes. Cut the stems off the peppers and discard. I sliced each pepper in half and removed the seeds using a small spoon. 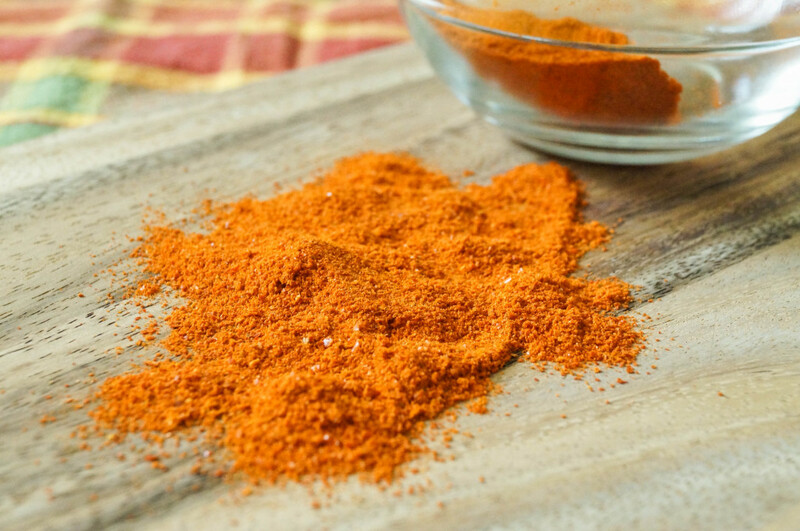 You can skip this step and leave the seeds in if you want an extra spicy powder. 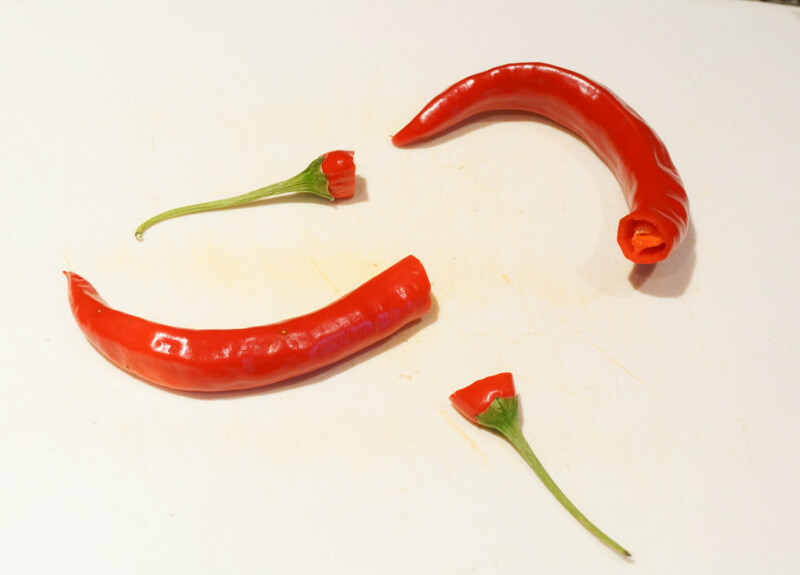 If not removing the seeds, you can still cut the peppers in half to decrease the drying time. Arrange the peppers in a single layer on a baking sheet, not touching if possible. 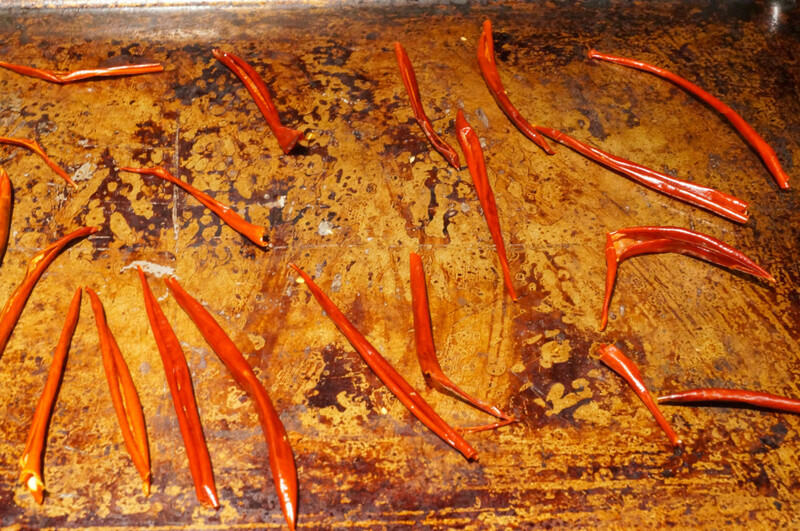 Dry the peppers in a 200 degree F oven until they become brittle and break when bent. This can take 3-8 hours, depending on the size of your peppers and if they have been sliced. Check on the peppers every hour. Still handle the dried peppers with care. They continue to have the oil that irritates the skin and especially the eyes. 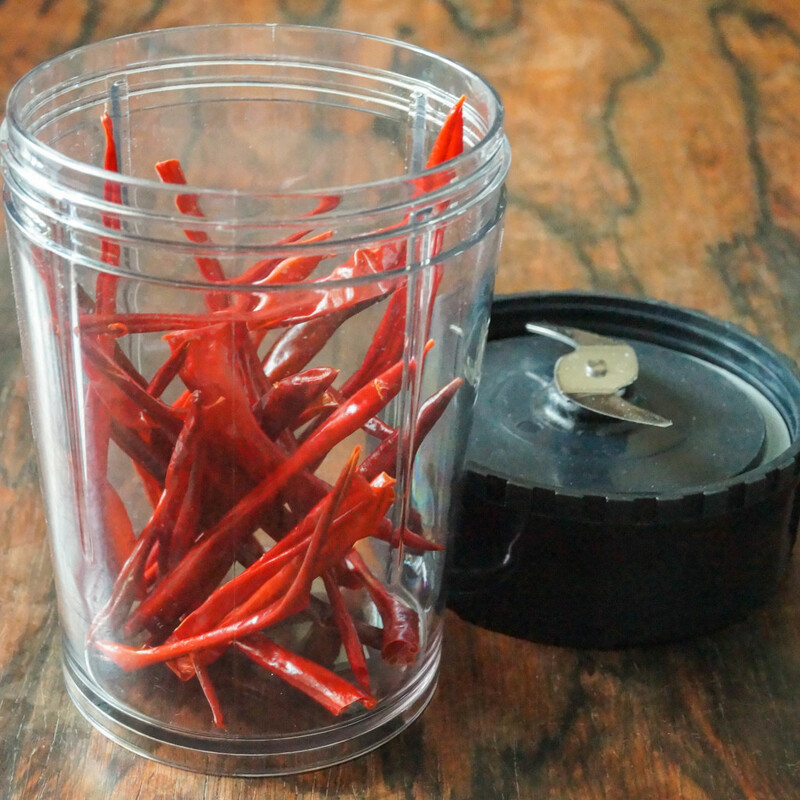 Use a spice grinder to grind the dried peppers until they become powdery. A word of warning: give the powder time to settle before opening the container. I opened it right away to make sure the mixture was thoroughly ground and ended up with a face full of cayenne smoke. Not fun. If you pulse the mixture only a couple of times, then you will get red pepper flakes. If you don’t have a spice grinder, you can also use a mortar and pestle. Store the ground pepper in an airtight container at cool to room temperature. Use within 6 months for the best flavor. There are no specific amounts for this recipe, just as many peppers as you want to turn to powder. 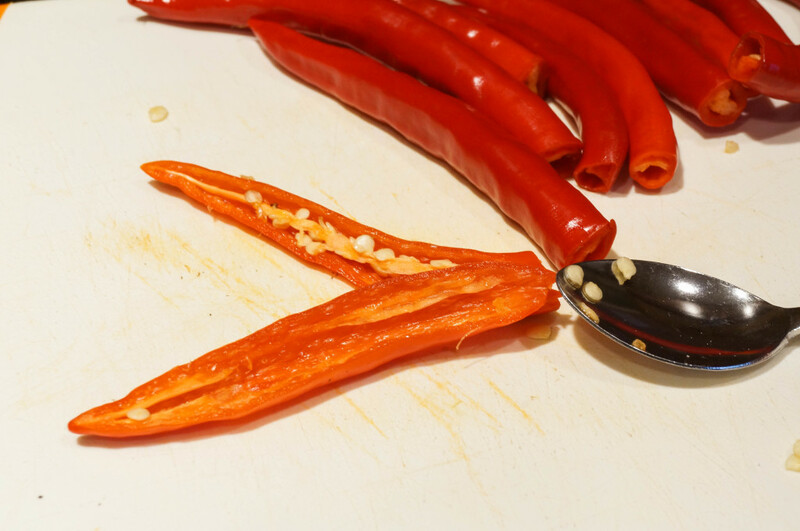 Using gloves and being careful not to touch your face, remove the stems from the peppers. 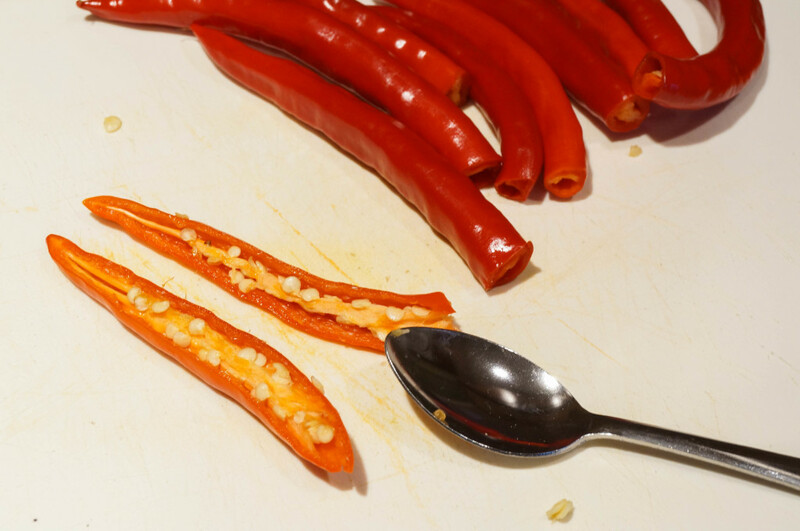 For a more mild pepper, cut them in half lengthwise and use a small spoon to scrape out the seeds. If not removing the seeds, they can still be cut in half lengthwise to decrease the drying time. 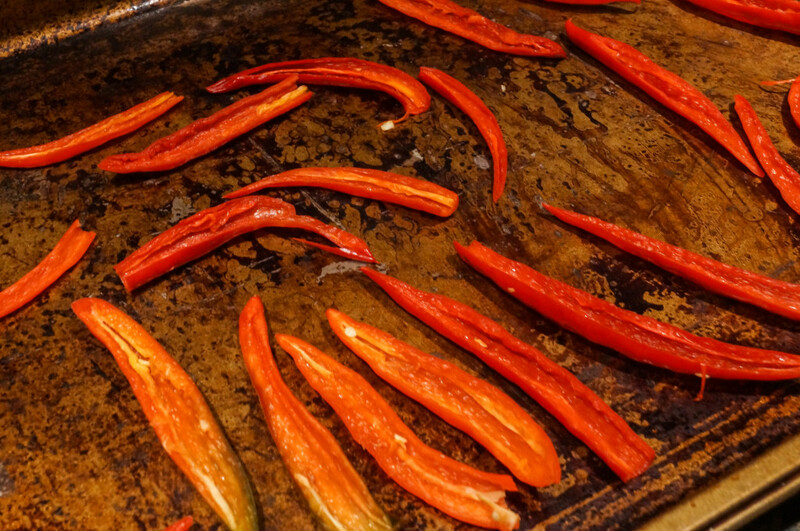 Arrange the peppers in a single layer on a baking sheet, not touching if possible. Dry in preheated oven until they become crisp and brittle. They should break and crumble when bent. This will take between 3-8 hours. 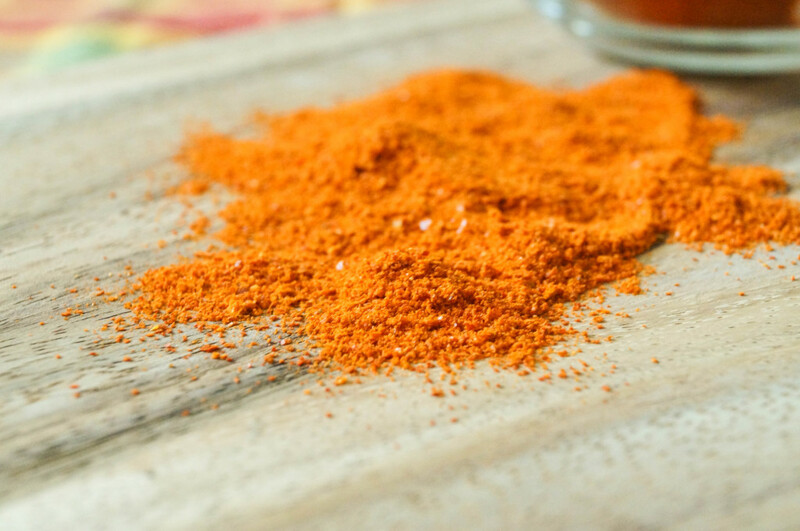 Place the dried peppers in a spice grinder or use a mortar and pestle to grind until they turn into a fine powder. If using a spice grinder, allow the dust to settle before opening the top. Transfer to an airtight container and store at cool to room temperature. Use within 6 months for the best flavor. This would make a great gift for your spice loving friends and family, too. Give a little sweet and heat package. Not to outdo myself, I accidentally bought hotter peppers this year too. Thought I was getting something similar to Scotch Bonnet and it turns out they are Trinidad Scorpion (the second hottest peppers in the world, hotter than Ghost Peppers).